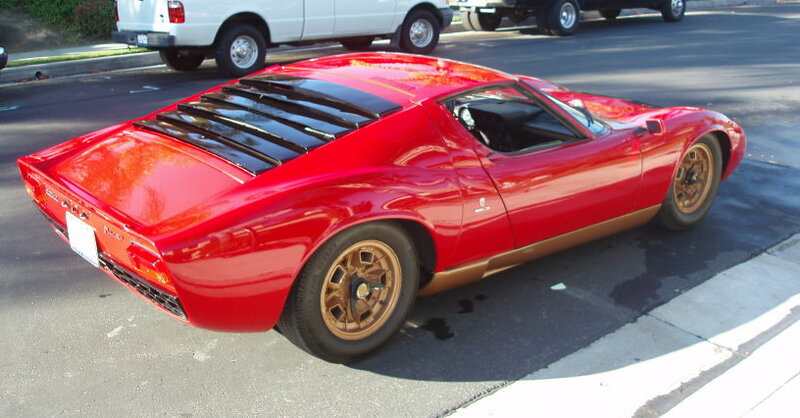 This web site is dedicated soley to the Lamborghini Miura. The site provides detailed information about the car and its variations, the P400, S, and SV. I am partial to all early Lamborghinis, but it was the Miura that I first saw on a 1971/1972 TV show, "Cade's County," that attracted my attention like no other car before or since. At the moment, the site is primarily being used to document the restoration of my own Miura, #3901. I have had the car since 1982 and it is finally being restored. I have never driven the car. I bought it with the engine out. With this site I can keep friends and family up-to-date with progress news and photos. This way they'll really believe me when I tell them it's finally being restored. As I have time, I will add general Miura information to the site. I welcome your suggestions. 10/29/18 Almost exactly a year since my last update, the Urraco is finally back on the road again! It was ready for the Lamborghini Club San Diego meet, and I had a great time. I will post photos of the event soon. See Urraco For Sale, Page 16 to see the shocking (pun) reassmebly. 8/28/17 Another year gone by! Wow. I returned from Monterey last week. The Urraco didn't make it this year. See Urraco For Sale, Page 15 for the story. 8/24/16 MADE IT! I had a great time. I'll post more photos later. 6/30/16 No Miura progress, but the Urraco is slowly being readied for Monterey this August. (I almost hate to say it - no jinx this year!). I've updated my Links page because many were old (gone) and I found new ones I like. So this list is smaller, but all link to active sites. One is brand new today and that's a video about the 50th anniversary for the Miura, held by the factory. I was invited, but as you know my car was sadly in no condition to go. 6/20/16 My longtime friend Jim Kaminski pointed out an error in the serial number list under Miura Info > Production. He also shared this great video of Lamborghini Miura SV Amelia PoloStorico’s First Restoration. Thanks Jim! 4/17/16 Finally an update on the Urraco. I've been driving it, but the steering has made a clunking sound since I bought the car. Time to fix that annoying noise. See Urraco For Sale, Page 13. 2/11/15 I think the Urraco market (the whole car market really) must be heating up because I've received a lot of e-mails asking about my car. It's coming along. I'm very happy with the brakes and it goes great, but it needs new tires (the XWXs are 20 years old), the AC needs to be recharged, and there are some electrical issues to sort out. I'm also thinking of having the interior completely redone. Then I want to enjoy it for a while before selling it. Eventually it will be sold because I want to fund the Miura restoration, but once the Urraco is gone it could be several more years before I have a running Lamborghini again, and I've just gone too long without a cool car to drive. Maybe later year. In the mean time, this is what I like to see: 1975 Urraco Typo 111 (like mine) sells at auction last month. 12/2/14 All hydraulics have been rebuilt. But there's more to do. See Urraco For Sale, Page 12. 11/4/14 All the brake and clutch hydraulic parts have arrived and I'll add more soon showing the rebuild. In the mean time, have a look at fellow San Diegian Gene Ondrusek's car on this recently done Petrolicious video! Contragulations Gene. 10/11/14 Fixing up the Urraco's brake and clutch hydraulics. See Urraco For Sale, Page 11. 8/13/14 The Urraco is almost done, but not ready to take to Monterey. There are other shows coming up. See Urraco For Sale, Page 10. 8/8/14 Determined to finish the Urraco next week for Monterey! See Urraco For Sale, Page 10. 2/3/14 I never cease to be amazed at how sneaky time is. It just slips by in a blink. I can’t believe I made no updates in 2013 – and that means (almost) no progress. Well, I was re-motivated recently and spent a few weekends buffing the paint. I think I just got burned out on sanding. It seemed never-ending. See Urraco For Sale, Page 9. 3/4/12 A false start at color sanding the Urraco, and the engine is dropped out of the car for a refresh. See Urraco For Sale, Page 8. 2/21/12 After a long break, I'm back working on the Urraco. Now comes... more sanding. See Urraco For Sale, Page 7. 8/7/11 It's been a couple of weekends since I painted the Urraco body, and now the rest of the parts are painted. I've added more photos to Urraco For Sale, Page 6. 7/24/11 After many, many years, the Urraco is finally painted! After wrestling with color choices, I finally painted it what I wanted. Maybe not the best choice for a car I plan to sell, but at least I'm very happy with it. See Urraco For Sale, Page 6. 9/6/10 All the bodywork on the Urraco has been done, and it's been painted in primer for final blocking. This is exciting! See Urraco For Sale, Page 5. 8/9/10 I can't believe it's been six months since my last update! I have been doing a lot of work on the Urraco but it's all been sanding the bodywork, and photos don't really show what's happening. "Here it is in primer." "And here it is in primer a month later." Painting a car is 98% sanding, and that's what I've been doing. As soon as the whole car is blocked perfectly, I'll post some photos. Today Gary Bobileff called me to say an envelope had arrived for me at his shop. I stopped by after work to pick it up and was absolutely delighted to find a CD-R labeled Cade's County Lambo Miura Series! As soon as I got home I put it my computer and there were four video clips of the Miura from the show! They are dubbed in French. THANK YOU very much! I really enjoyed seeing the clips. The car is a P400 with a few oddities, such as four exhaust tips, chrome headlight rings, and the front bumper looks like it might be chromed. 2/24/10 A bit of progress: In December I sent my shocks to Koni to be rebuilt and they arrived today. See Page 30. 12/15/09 BIG NEWS: The Miura has come home! See Page 29. 9/15/09 Primer coat done - see Page 28. I went to Monterey this August for The Weekend. After a dismal last year on the Marina Airport tarmac, it was great to be back on green grass at the Laguna Seca Golf Ranch, just a short distance from the race track. It was fun seeing old friends and meeting new ones, and of course seeing some great cars. I met Scott Reid, who is developing a bolt-on dry-sump system for the Miura. Visit Scott's site at MiurEssence. 9/9/09 The Miura is getting another coat of primer. Photos on Page 28. 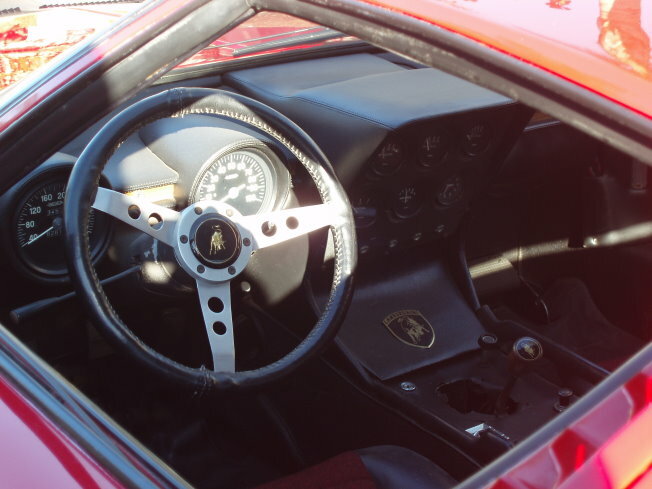 3/1/09 More updates to the new Miura Info section, especially for the Roadster page. 2/22/09 I got carried away today and completely redid the menus and restructured the P400/S/SV pages. This information, and more, has been moved to the new Miura Info section, where I will continue to add general Miura information, as I originally intended when I started this site in 2000. I have also updated the Books page, after buying Joe Sackey's excellent The Miura Bible - truly a "must have" for any Miura fan. I welcome your comments and suggestions on the new navigation and information. More coming soon! 1/10/09 Happy new year! I've occasionally been contacted by people looking for Miuras - especially project cars. Don Sullivan has decided to sell his 1968 Miura P400. Unfortunately Don’s car no longer has its V-12. The engine was owned by Jay Leno (and may still be). This Miura has a Chevy V-8. 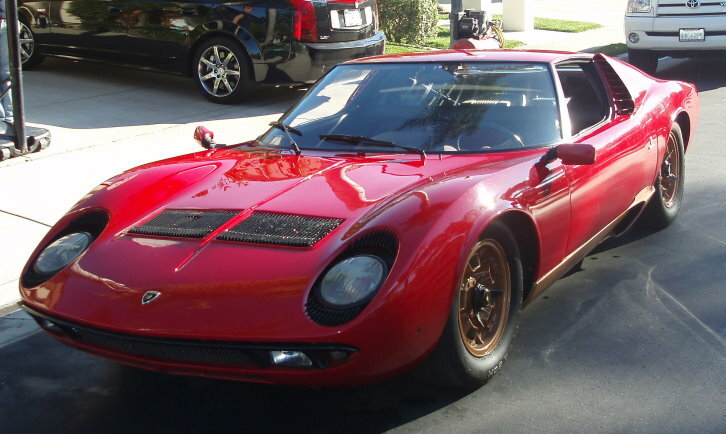 I wrote this Miura up for the Lamborghini Club newsletter many years ago. 1/23/09: This posting found a buyer for Don's car. It has been sold. 10/26/08 I've moved the home page tribute to my dear friend Bob Merrell inside this site to a new menu button on the left. Several personal events have made it seem like it's the right time. There hasn't been any progress on the Miura, but I've done some work on the Urraco, so I'll have some photos to add soon. 6/27/08 I'm remembering my friend Bob today on the anniversary of his passing, and thought I'd update the site with news. Unfortunately I don't have any good news. Bobileff has given priority to other customer's cars, which came in after mine, and while the Miura Roadster and Miura SVJ are being readied for Monterey, 3901 has been pushed aside. I was really hoping to have the car ready. This year Lamborghini is being honored, and I made a promise to Bob that the car would be finished. I'm not happy about it. I'll try to get the Urraco finished so I can participate in the celebration of my favorite car company. 5/25/08 I spent today at Bobileff's working on the car. I've added a few pictures of parts getting ready, and the result of my efforts today on Page 27. 5/17/08 I've updated the Acqusition page with the history of 3901. Thanks to "Lambo" Jack Riddell I was able to contact Enzo Moruzzi at Lamborghini who worked there when my car was built - both times. 4/19/08 The body sections start to come together and parts are test fit before final blocking begins. See Page 26. 2/26/08 The Miura headlights clean up beautifully, but progress stalls on the Urraco as I succumb to a miserable cold. Page 25 added to Restoration. 2/10/08 Progress resumes on the Urraco. I've posted a new page showing the interior going back together. Expect weekly updates on that project until it's done. One way or another, I'll have a running Lamborghini to take to Monterey in August. 1/19/08 I've taken all my remaining Miura parts to Bobileff Motors, and work on frame is finally complete! Body work begins with panel alignment. 12/26/07 Last update of the year. Restoration page 23 added to show the SV suspension conversion is complete. Only a very few more frame updates left to do. 11/12/07 I've added updates for Sept and Nov to the restoration pages (21 and 22). The SV control arms are ready to go! Someone suggested that by providing links to Amazon from points in my site, I may earn enough to cover the costs of the site. Since this is a non-profit, hobby site, I'm considering it. It would be nice if the site could pay for itself. Any comments? 7/22/07 I finally got another scanner (my old one failed years ago) and so I scanned in the rest of my books and brought that list up to date. I also sorted the publications by date. 7/1/07 My dear friend Bob Merrell, who is forever tied to 3901, passed away on June 27th. This is a tremendous personal loss. I've added a dedication page that will remain for some time. Please take a moment to read it. I hope you can take some inspiration from this, as Bob inspired me. Eventually I will create a tribute section for this site. Gary performed a fitting experiment with SV suspension, and my new rods arrive. See page 20. 3/25/07 A couple weeks ago I took all of the interior parts down to Bobileff so that the upholstery work could begin. I'm eager to see these old parts in their new leather and color. The photos are on page 19. I also have some Urraco progress photos to post. Coming soon. 12/31/06 Finally, a new page 18 showing the body work! Progress continues again, and I should have steady updates now until the gala unveiling at Monterey in August! 11/22/06 Just a quick note to let you know that I haven't died or given up on the restoration. In fact, I have recently managed to fund the balance of the work and am hoping that the car will be ready to take to Monterey in August 07. With the new crankshaft and other updates done on the engine, I decided to splurge and order a new set of custom rods from Carrillo Industries. I hope to have some photos to share soon. Thanks to everyone who has contacted me with support to keep up the work. 3/12/06 I finally took all the pistons and rods back to Bobileff Motorcar, so the engine will start going together soon. No new pix yet, but I'll add them as the engine work progresses. 10/23/05 Engine work progresses slowly on the pistons and rods. New pics posted. 11/23/04 If you need a set of vintage tires for your exotic, join the Lamborghini Registry and other vintage sports owners in writing Pirelli to let them know. Click here to learn more. 9/10/04 The new Miura crankshaft has arrived. 7/24/04 More of the Urraco is painted in primer. Only a few weeks before it's yellow! 7/18/04 A bit more work on the Urraco to primer more parts. 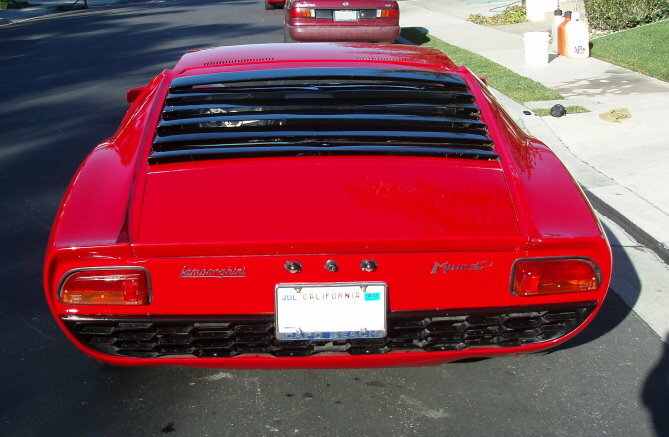 6/12/04 I had to share this picture from the Lamborghini Registry. This is close to what my car will look like when it's done. My block is now having new sleves inserted, so I should have some new pictures next week. 4/24/04 I've bought two die cast cars that I really like: An AutoArt Miura SV and a Koysho Countach LP400. I've added both to the models page. There are also some photos of my new valves on restoration page 13. More head work to come. 9/6/03 I've added a section for scale models. 8/31/03 Starting on the engine. See Restoration page 12 for the evolving crankshaft story. 4/17/03 page 11 shows more frame work. Almost done now. 3/19/03 The frame is back from Ye Olde Twist & Stretche Shoppe, all squared up. See page 9. 2/23/03 I've posted a new restoration page 8 just to get into practice of updating this site again. :-) I've managed to fund some more restoration work, so you should see some progress soon. 1/19/03 I've received several e-mails asking how the project is coming along. I can't believe it's been over a year since I updated this site - and worse, made any significant progress on the Miura. I did buy, via Bobileff, a pair of Espada lower rear control arms, which will be modified to match Miura SV suspension. I'm considering this upgrade. While it has handling advantages, creating an S with SV suspension results in a car that the factory never made, so (what's left of) the purist in me is hesitating. Stay tuned. Much progress has been made on the Urraco, although it is not yet yellow. I was given a digital camera for Christmas, so I will be taking photos soon to show you the Urraco. Thanks to all who have written with questions, encouragement, and shared your stories with empathy. 8/12/01 Projects always take longer than I think. The Urraco is almost ready for yellow paint. 7/2/01 I've received some e-mail from people asking how the Miura is coming. Unfortunately, I have kept this site up to date. In other words - no progress. I expect to paint the Urraco this week, so I'll post some photos of it when it's done. I visited the Miura at Bobileff's last week. Including mine, Gary has five Miura's in his shop: Two SV's, an S, and another P400. Naturally, we're copying all the S and SV mods to my car. Or rather, we will be when the Urraco sells. Stay tuned. 3/25/01 I've added a few photos to the "Other Photos" section. The Urraco is coming along slowly. The car has been painted several times, and removing all the paint is taking more weekends that I thought. And I'm finding I have less weekends to work on it than I thought. Still, progress was made today. I hope to have it painted in another month. 1/27/01 I've almost finished adding my Lamborghini library to the "Books" page, including my Miura book that was autographed by Lamborghini! I've also updated the left nav. No progress on the Miura, but the Urraco is coming along. It is almost primered. Most votes are for yellow :-) and two people have suggested I let the buyer choose. I'll try that for a couple of weeks after the car is in primer, but I want to make progress so I can get back to the Miura. I enjoy hearing from other Miura fans and welcome your comments. 12/16/00 Sorry, not much going on with the Miura or Urraco. I will be adding some books (new section) that I have, to give you something new to look at while the Miura project waits for the Urraco to sell. I expect progress on the Miura will resume in January or February. Happy Holidays! 11/4/00 I've added some photos in the "Early Efforts" section, and a few more Urraco photos. Also added a new "Other Photos" page. 10/29/00 The new pictures are up.